A strong earthquake struck central Taiwan on Wednesday, killing one person and injuring 19 as it damaged buildings on the quake-prone island.The magnitude-6.1 earthquake was felt throughout the island. Buildings swayed in the capital Taipei, and sections of the high-speed rail were suspended from service to be inspected for damage. The quake’s depth was a relatively shallow 15 kilometers (9 miles). A72-year-old woman became the first known fatality from the quake when a temple wall she was standing next to collapsed and crushed her in the mostly rural county of Nantou.Near the Nantou epicenter, a section of a ceiling fell from a government office and injured one worker, officials said. All-together, at least 19 people were injured, mostly by falling objects, the Fire Department said. A house fire caused by leaking gas was quickly put out, it added. Nantou is a rural county about 250 kilometers (about 155 miles) south of Taipei. It is near the epicenter of a magnitude-7.6 earthquake that killed more than 2,300 people in 1999. 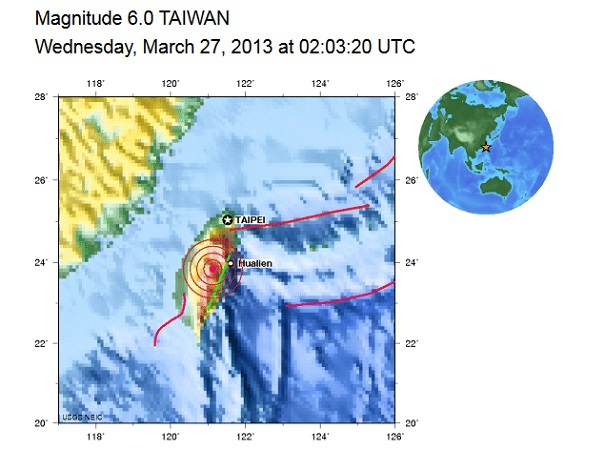 Earthquakes frequently rattle Taiwan, but most are minor and cause little or no damage. What were the impacts of the earthquake as mentioned in the article? Why do you think there are more casualties in the 1999 earthquake compared to this one in 2013? The article mentioned that earthquakes are frequent in Taiwan - why do you think is the cause of earthquakes in Taiwan? Look at the location of Taiwan in the map extract- why do you think the island frequently experience earthquakes? 0 Response to "Taiwan Earthquake 27 March 2013"